You’d think by now that the Trump regime might have figured out not to mess with Congresswoman Maxine Waters. Donald Trump spent two years hurling thinly veiled racist attacks at her, and it only served to elevate her stature as she became Chairwoman of the House Financial Services Committee. Now Trump’s Treasury Secretary Steve Mnuchin tried taking on Waters directly today, and let’s just say that it didn’t go well for him. Mnuchin was scheduled to testify before Maxine Waters’ committee today, and at the last minute he informed Waters that he had an important meeting this evening with the leader of Bahrain, and that he would be leaving the hearing at 5pm whether it was finished or not. At best, Mnuchin would have known about this meeting well in advance, and purposely waited until the last minute to inform Waters. At worst, Mnuchin made a point of scheduling this meeting at the last minute so he’d have an excuse to bail on his testimony if it wasn’t going well for him. Either way, Maxine Waters wasn’t having it. She told Mnuchin that he was free to get up and walk out, but she made no movement to call the hearing to a close. He seemed confused, and perhaps afraid that he if did try to leave without permission, she’d have him arrested for contempt of Congress. Waters didn’t have to make any specific threats, as the implied threat was working well for her; at one point Mnuchin meekly asked Waters to bang her gavel so he could leave, but he mistakenly called it a “gravel” – setting off numerous jokes across Twitter. Of course the larger point here is that another House committee, the House Ways and Means Committee, is currently in the process of pulling Donald Trump’s tax returns. Steve Mnuchin, as the head of the Treasury Department, is legally prohibited from interfering with this process – but it’s widely expected that Trump will instruct him to illegally try to interfere anyway. 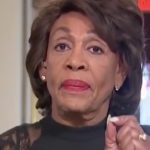 So it’s noteworthy that as this tax return battle heats up, Maxine Waters the House Democrats appear to have Mnuchin running scared.